Henry Cavill News: 'Mission: Impossible Fallout' Opens Big Around The World! 'Mission: Impossible Fallout' Opens Big Around The World! Nomis director David Raymond also gave Henry some well deserved praise online. If you're ready to read the reasoning on why the movie went the way it did (regarding Henry's character), make sure to read USA Today's spoilerish interview with director Chris McQuarrie. Congratulations to Henry and everyone involved with making the super fun ride that is Mission: Impossible Fallout. Have you watched it yet? the bigger the screen, the better the experience! Congrats to all involved and especially Mr. Cavill of course. Si muchas felicidades a todos!!! Me encanto ver a mi Henry tan bello interpretar un papel muy diferente, pero no les voy a mentir, yo si sufri con ese final. I loved seeing my Henry so handsome play a very different role, but I'm not going to lie, I suffered with that ending. 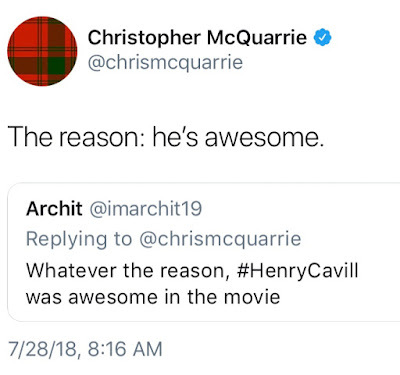 Yes, too bad because you know he won't be in any sequel. ***WARNING DOES CONTAIN POSSIBLE SPOILERS*** I loved the movie and loved seeing Henry play the bad guy. I was a little shocked! I admit because I thought he was going to be good with a slight twist. That would get on Ethan and the teams nerves a bit. Example don't go in there guns blazing August I know what I am doing gets in some trouble Ethan will have to help him out. Or August would have to continuously prove that even though he's an outsider he's here to help!. I do have a theory, which is a long shot. That face changing thing could have been used on the real August Walker and the real August will make an appearance in the sequel…. its a long shot but very possible. And he'll be helping the team but will have to prove he's not the villain or working against them. I LOVE LOVE your theory Nicole. you give hope with your theory! Se puede esperar cualqier cosa de MIF. Hello. I saw the movie yesterday and my god! It is amazing and Herny did a great job. Super movie!!!! As a goody goody, I didn't know I have a part of me which will say: "The bathroom fight was awesome!" That move from shoulder when August threw the third man (Liang Yang) above it was great and the series of "I will show you" punches also. The other part which stayed with me is a scene in the elevator where August shows the picture of J. to Hunt. 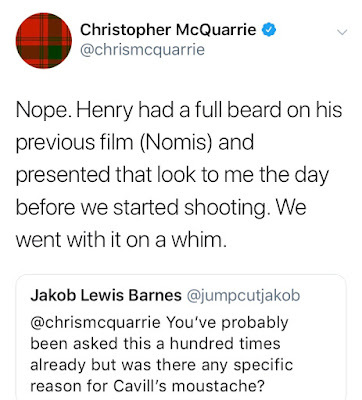 I know for "Nomis", but it may be too dark for me. Henry Thanks London. Next Stop: Seoul!